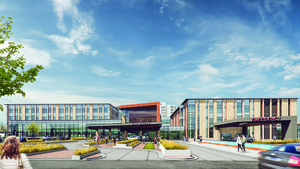 The transformation of Regional Health Rapid City Hospital is now in full swing. The hospital kicked off a major expansion project and also celebrated the Phase 1 completion of its multi-story covered parking structure. The full project will encompass a new three-story front entrance, a larger and more efficient emergency department, as well as additional space for patient beds and medical offices. Other components include space for clinics and future growth, along with Phase 2 of the parking structure. When fully complete in 2020, the $200 million project will add 266,000 sq. feet of internal space and 1,296 parking stalls, with 665 of them covered. 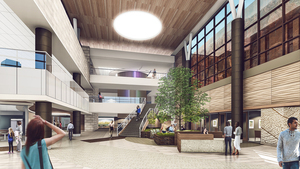 The three-story, glass front entrance will be accessed from Fifth Street and face south, connecting to the new parking ramps and surrounding hills. It will enclose a large commons area with community spaces, dining, spiritual healing spaces, a waiting lounge, home medical equipment, and retail shops. The new 36,000-square-foot ED will be half again as large as the current one, with 34 private exam rooms, five state-of-the-art trauma exam rooms, and three resuscitation rooms. An enclosed drive-through ambulance garage will have space for up to six ambulances. The current department has 26 exam rooms, including six trauma rooms, and the enclosed garage has space for three ambulances. The new Emergency Department will have an integrated clinical decision unit with 12 rooms and future growth space for an additional six. Interventional Cardiologist Joseph Tuma, M.D., welcomes the addition of clinical space built in tandem with emergency services. The new 30,333 square foot cardiac intermediate unit will be 40 percent larger than the existing CIU. THe Heart and Vascular Institute outpatient/clinic offices will be relocated to a space two floors above the ED. · The lower level will have space for the future addition of support and environmental services, clinical engineering, and storage. The hospital currently lacks interior space for growth. · Level 1 will feature the expanded emergency department. It also will include future growth space for pre-op and surgery areas. There also will be access to outdoor healing gardens. · Level 2 will house the 32-bed cardiac intermediate unit. · Level 3 will house future integrated clinic space – specialty clinics that connect to the hospital for the benefit of patients and doctors. · A helipad on the fourth level will have elevator access directly to trauma and emergency services. The design of the new patient rooms departs from the clover-shaped pods used for the existing hospital towers. The new design follows a Lean-Led initiative to maximize efficiency. The newly completed first phase of parking construction created 754 parking spaces, of which 350 are covered. The second phase will add 542 spaces, with 315 of them covered. Complementing the hospital expansion is an upgrade to the central utilities plant to create additional capacity for heating and cooling. · The Advanced Orthopedic and Sports Medicine Institute is under construction at Buffalo Crossing, near the corner of Highway 16 and Catron Boulevard, with an expected completion in fall 2018. · The new Custer Hospital and Clinic is nearing completion, with an expected open date of April 2018. · The new Sturgis Clinic is under construction connecting clinical services to the Sturgis Hospital, with an expected completion in February 2018.